A Cake Bakes in Brooklyn: Is Divinity Dead? Last week, I made divinity for a friend's birthday, and along the way discovered that divinity is dead, or at least nearly extinct. No one I asked had ever heard of this old-fashioned confection except the birthday boy (and not because he's a divinity school graduate, but because his grandmother used to make it at Christmas). After doing a bit of research, I've concluded that capitalism may have killed the candy. Nearly every vintage cookbook features numerous recipes for divinity (and its contemporaries fudge and taffy). But unlike fudge and taffy, I've never seen a piece of divinity for sale. Could no one figure out how to make this meringue-like candy commercially viable? Since hardly anyone makes candy at home these days, if a specific candy isn't sold in stores, does it simply suffer the same fate as dinosaurs? Apparently so. While I knew of divinity from reading old cookbooks, the real-life candy had eluded me -- I had never seen or tasted it. This lack of reference was challenging, and I admit to saying more than a few prayers last Saturday as the sugar syrup was boiling. My prayers weren't entirely answered. 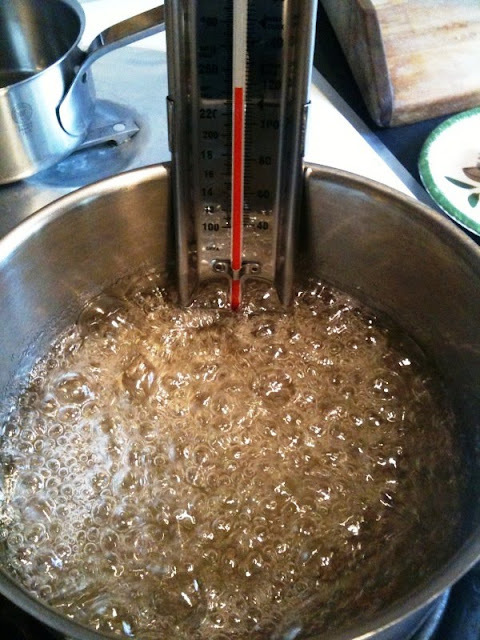 My first, among many mistakes, was undertaking candy making on a rainy day but the birthday dinner was that evening and I had (as usual) waited until the last minute. Second, I relied entirely on a vintage recipe from an old (and unillustrated) book for Ohio housewives that left out an essential descriptive detail -- beat the candy until it loses its shine. It said to beat until it held its shape, but that's pretty subjective. I was afraid to go too far, having once turned whipped cream into butter by overbeating, while I had a room full of dinner party guests awaiting dessert. I wish I could say that the divinity (pictured above) at the very top was the one I made instead of an image I pulled off the internet. My divinity (too shiny, too flat) are pictured below. Still the flavor was pretty good and I probably ate just as many as I boxed up for the birthday gift. I suspect I'll be making them for Christmas, on a very dry and sunny December day, and with an added teaspoon of confidence. 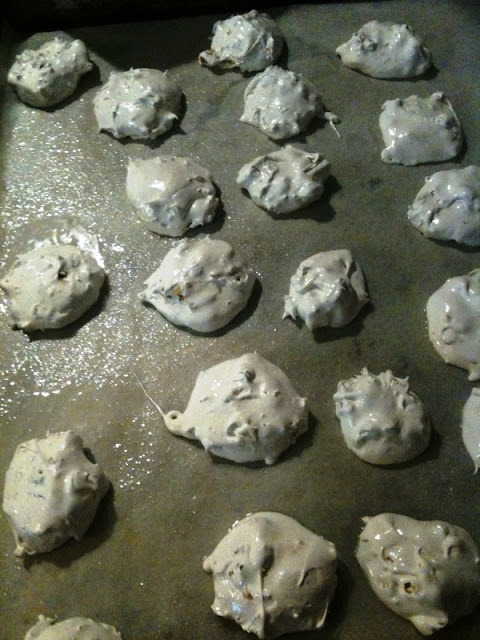 Reminds me of meringue cookies which are hard, not chewy, and pretty awful. Are these chewy? How did your friend like them? These were a bit chewy, though not sure they were supposed to be! Jay, ever gracious, was very kind about the candy, though I very much doubt they were like the ones from his childhood. And good observation, they are a bit like those meringue cookies that are all over the place these days which often are akin to eating sweet sawdust, though much better (if I do say so myself!). 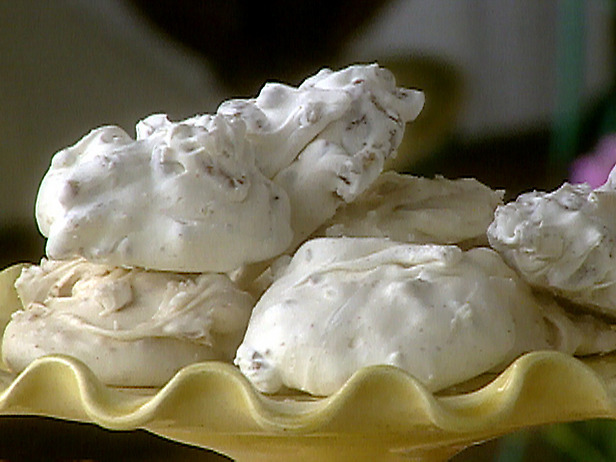 Martha: You just gave me a great idea -- pralines, which I adore! Thanks. @Anonymous -- Great story, thanks for sharing. Not sure if divinity is a southern tradition, though it may have started there. The priest I made this for is from Minnesota and South Dakota, and he remembers his grandmother making it. My grandmother from South Dakota just gave me the recipe. She said she has been accused of altering the ingredients so doesn't give the recipe out often. Apparently one has to hone this recipe in order to make it properly unless one is able to learn hands on from Granny. I think one important factor is adding the sugar mixture to the egg whites slowly beating the entire mixture while doing so. @Anonymous: Thanks for writing! I just came across two hand-written divinity recipes (one involving the use of a microwave!!) and if the humidity ever goes down here I'll give them a try. You're lucky to get your grandmother's recipe. Do let us know how it turns out and I think you're right re: adding the sugar slowly. Wow, Tiffany! I admire you for carrying on without the heavy machinery. It does make one wonder how our grandmothers got by without all this modern equipment! You're lucky to have the bazaar each year, but if you do give my recipe a try, please report back. Good luck and thanks for writing. I saw the great article about your blog in the March 2012 issue of Ladies Home Journal. I love vintage recipes and I did try to reconstruct a family cake recipe with just the ingredients! Quite a challenge. My third grade teacher in Ohio made divinity for the class several times during the year as a treat back in the 1960's. After your point about no one making divinity, I do believe I will give it a try in the near future. I just made divinity and realize now, as I attempted it, how much has been lost in our current Era of convenience....yes, my divinity flopped, but it was a labor of love mostly as I reflected on my grandma's perfection and pride in her baking. Thanks for your article!